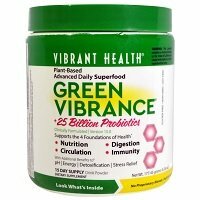 Overall, at 2.5 out of 5 stars, Vibrant Health Green Vibrance is an average probiotic supplement. I like that the capsules are soy free, gluten free, plant-based and NON-GMO. You also don’t have to refrigerate it, so it makes it more convenient and stable. I really like the idea of a daily superfood supplement plus probiotics. This formula contains a TON of extra vitamins and minerals – I can’t even list them all for you! However, even though I really like the idea of it all, it’s just not practical for daily use. 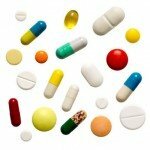 You have to take 16 capsules per day. Yes! You heard me right… sixteen. It was such a chore taking these capsules; I wanted to give up certain days. The capsules are also pretty big and definitely got stuck in my throat. They also tasted like Metamucil, which isn’t a good taste in my opinion. They were rather gross. They recommend taking all 16 at once (I don’t recommend this) or spaced throughout the day (I do recommend this). I also think they use too many CFUs (25 billion) and too many probiotic strains (12) for a daily supplement. 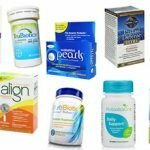 Too many of either can lead to side effects and the probiotics can even begin to compete with each other if there are too many. Overall, at 2.5 out of 5 stars, Vibrant Health Green Vibrance is an average probiotic because it’s gluten free, soy free, and a plant-based superfood supplement but you have to take WAY too many capsules per day and they also use too many CFU and strains to be a safe and effective daily support. 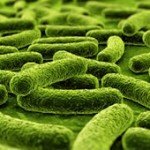 Vibrant Health Green Vibrance has 25 billion cells and 12 probiotic strains. This strain has been researched to show potential increases in immunity and colon function. It may be able to help reduce gas, bloating, constipation, and diarrhea. Green Vibrance is gluten free and soy free. However, it doesn’t list any other major allergens. 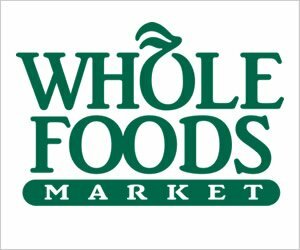 Since this product has SO many added ingredients and nutrients, please visit their website and take a look at each ingredient to make sure you’re not allergic or sensitive to any. The supplements also contain: Govanil Natural vanilla powder (35mg) and vegetable cellulose capsule. For 240 capsules, lasting only 15 days, it costs $29.95. Since you have to take 16 capsules daily, that works out to a whopping $1.99 per day. You do get so many added nutrients and ingredients along with the probiotics but I’m not sure I’d want to pay that high of a price tag again. I think it’s a decent value for the price, however I think there are better values out there. I surprisingly didn’t see any side effects while taking Green Vibrance. It has SO many additions; I thought I’d see some sort of side effects. Green Vibrance has a lot going on, so if you have a sensitive stomach I’d be careful with this one. Vibrant Health does offer a 90-day, money back guarantee. However, it only applies to their TOP TEN products. This is confusing because their TOP TEN isn’t explicitly stated (or at least I couldn’t find it). I’ve also never seen a company do this before. I suppose I’m thankful that they offer some sort of guarantee, but I’d rather see it be applied to ALL of their products. To buy Vibrant Health Green Vibrance, click here.